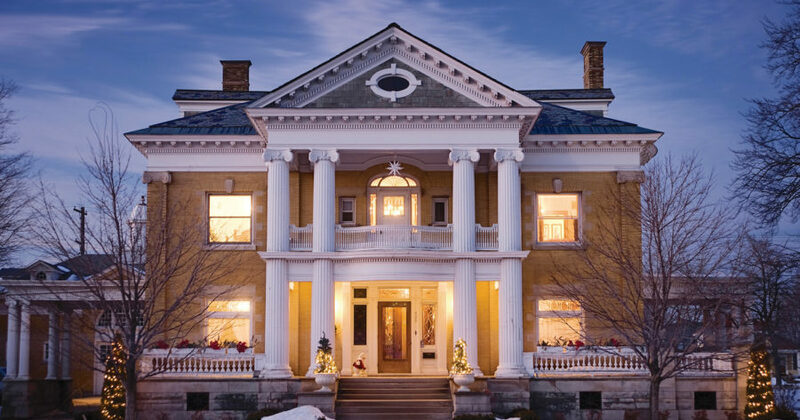 This Traverse classic about Ludington’s Cartier Mansion was featured in the February 2009 issue of Traverse, Northern Michigan’s Magazine. 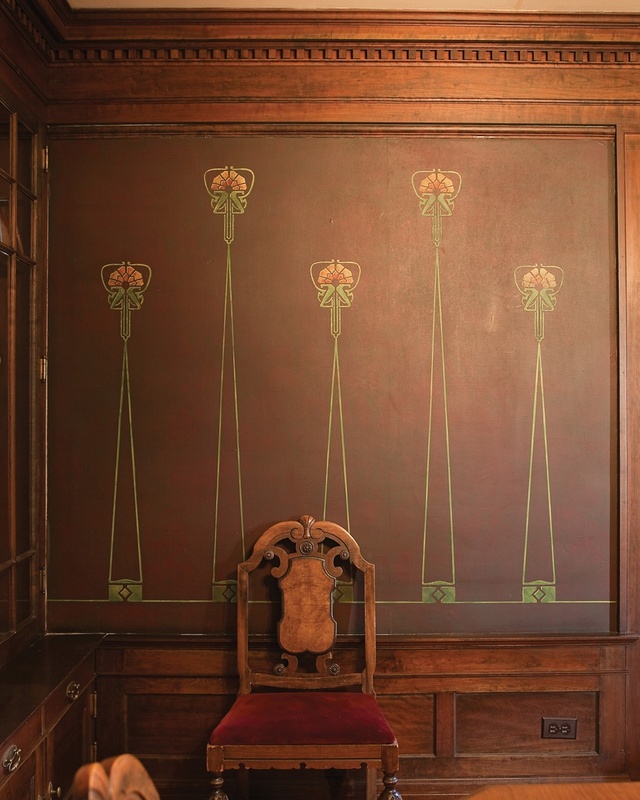 The story of any house begins with the dreamer who builds it—in this case, Warren Cartier. But to tell the tale of Warren Cartier, one must first share the story of the man who, one might say, built Warren: his father, Antoine Ephrem Cartier. Born in French-settled Canada in 1836, Antoine was raised on a farm near Quebec in a large stone manor named for the river it sat beside, Maskinonge. A mile upstream flowed the St. Lawrence River, which Antoine’s ancestor, French explorer Jacques Cartier, discovered then claimed for the French, along with all of Canada, 400 years before. If young Antoine was destined for great things, it wasn’t obvious. His father died when he was 10, and despite his older brothers’ urging, he avoided school and working the family farm, preferring instead to roam the vast woods of their river valley. At age 18, Antoine convinced his family that farming wasn’t his destiny and left for America. A big, brawny young man, Antoine easily found work unloading lumber ships in Chicago, then, after hopping one bound for its forest source—Manistee, Michigan—he hired on as a logger. Within two years Antoine had risen to woods foreman and masterminded, with newfound Irish pal Jim Dempsey, an angle into the lumbering business that didn’t require any capital: sorting and driving other companies’ cut timber from high up the Manistee River to the downstream mills. As Cartier and Dempsey Boom Company boomed, so did Antoine’s personal life. In 1859 he married Eliza Ann Ayers, an Indian-school teacher from what is now Traverse City’s Old Mission Peninsula. Within 13 years, he and Eliza had six children, and he and Jim had earned enough to buy their own sawmill. In 1877, Jim and Antoine added the Pere Marquette River to their contracts, and Antoine bought a swath of timberland down the coast. By then a father of eight, he moved his family to Ludington and commissioned a palatial Victorian home befitting a lumber baron and his brood. Its location: Ludington Avenue and Lavinia Street, northeast corner. Warren, Antoine’s second son and third eldest, was 12 years old when the Cartier clan moved to Ludington. As he came of age, Warren saw his father grow fantastically wealthy purchasing more land, buying and selling sawmills, and expanding his manufacturing interests. But Warren also saw in Antoine a man who was devoted to, and beloved by, his community. In 1880, less than three years after the family’s arrival, Ludington citizens elected Antoine, a staunch Democrat, mayor. They did again in 1881. And Antoine gave back. He organized the Water Works Co., which piped fresh water into the city. 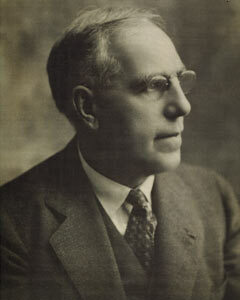 He led the charge to pave the city’s streets (though credit for the boulevard design, with flowering center islands and tree-lined edges, may go to his wife; legend has it Eliza suggested them when her husband grappled with the city’s lack of funds to pave Ludington streets to their full width). Antoine’s most generous effort on behalf of the people of Ludington occurred after the panic of 1893 when the city’s Commercial & Savings Bank failed. Then bank president, Antoine bore no legal or personal responsibility for the crash; nevertheless, he paid back every depositor, dollar for dollar, using his own money. It cost him $170,000, equal to $3.9 million in today’s dollars. The apple, it seems, didn’t fall far from the tree. During Antoine’s mayoral reign, Warren graduated high school, and like his father before him, left home to make his own way in the world. At age 16, he moved to Montreal for business school, then, before enrolling at Notre Dame University, worked two years as a bookkeeper to defray his college expenses. Tall and strong—again, like his father—Warren led Notre Dame’s first football team, rowed with the school crew and graduated with a degree in Civil Engineering. When he returned to Ludington, Warren joined his father’s lumber businesses and within the year embarked on what he later called his life’s most important achievement: his marriage to Kate Dempsey, a petite and vivacious gal from Wisconsin. The city greeted the newlyweds in style, flooding them with wedding gifts—pearl-handled fruit knives, oyster forks, table linens, poetry books, vases, silver spoons, pickle castors, teapots, and more—which the newspaper dutifully recounted. But likely the greatest gift of all came from Antoine himself. He gave the newlyweds a vast Victorian home—fully furnished and outfitted with the requisite porch, peaks and turret—one door east of his own. If Warren followed closely in his father’s footsteps, he certainly didn’t stay in Antoine’s shadow. He and Kate started a family of their own—three sons in three years—and Warren kicked off his own business ventures. While still working with his father, he partnered up with William Rath to create Rath & Cartier, a full-scale lumber firm. He organized the Ludington Gas Company to fuel the city. Fed up with the patchy service of the Bell Telephone Company, he launched the United Home Telephone Company, which went on to serve dozens of Michigan cities. He founded Ludington State Bank, headed up nine banks in other communities and became exceptionally wealthy in his own right. And like Antoine, Warren gave back. When his old alma mater couldn’t get a dollar from its alumni to build an enclosed athletic field in 1899, Warren not only promised aid but provided all the lumber for the proposed project, then offered to construct a fence and a grandstand, too. Notre Dame honored him by naming it Cartier Field; the football team honored him by going 23 straight years, undefeated, on its turf. A devoted Catholic like his father, Warren also helped found the Catholic Extension Society, which aided poor parishes and missions around the nation and later earned him a layman’s highest honor: a knighting by the pope. So perhaps it does not come as a surprise that in 1899 and again in 1903, Warren, like his dad, was elected mayor of Ludington. Very much unlike his Democrat father, however, Warren ran on the Republican ticket. And shortly after his second term, Warren broke ground of another sort. He moved his family from the house Antoine had gifted him and into a home of his own design, the finest the city of Ludington had ever seen. It sat directly opposite his father’s. Was Warren’s mansion a son’s attempt to outshine his father? A pointed effort to showcase his independent successes? Or simply the natural consequence of an accomplished man’s desire to build a home of his own? Whatever Warren’s motive, his home was a masterpiece. Built of Roman pressed brick and trimmed with Bedford limestone, the three-story mansion boasted the latest and greatest in modern conveniences: a progressive steam heating system, which allowed the occupants to adjust the temperature of any room to an exact setting; a pulley-operated draft system to provide cooling; transition chandeliers lit by both gas and electricity. Each of the boys’ second-floor bedrooms had a sink and closet. Kate’s silk-walled bedroom was outfitted with a full bath and petite-sized sink and flush toilet to match her diminutive size. 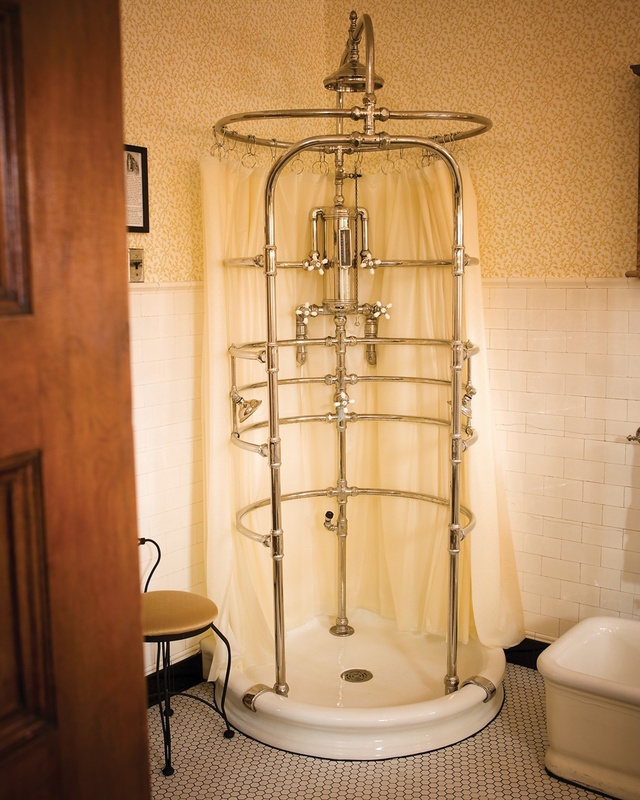 In the expansive bathroom of 6’4” Warren’s bedroom suite, mirrors were hung high to meet his gaze, and at his disposal was a generous-sized tub, footbath and—the cutting-edge must for any men of athleticism—an L. Wolff Manufacturing Co. multi-jet needle shower. On the main floor, a tiled anteroom led to a vaulted reception hall bearing a broad, sweeping staircase. Behind it hid an extravagant leather-walled library, modern kitchen and butler’s pantry; on either side sat a tranquil green music room and luxurious living room lined in velvet-cushioned window seats. Warren spared no expense, missed no detail. 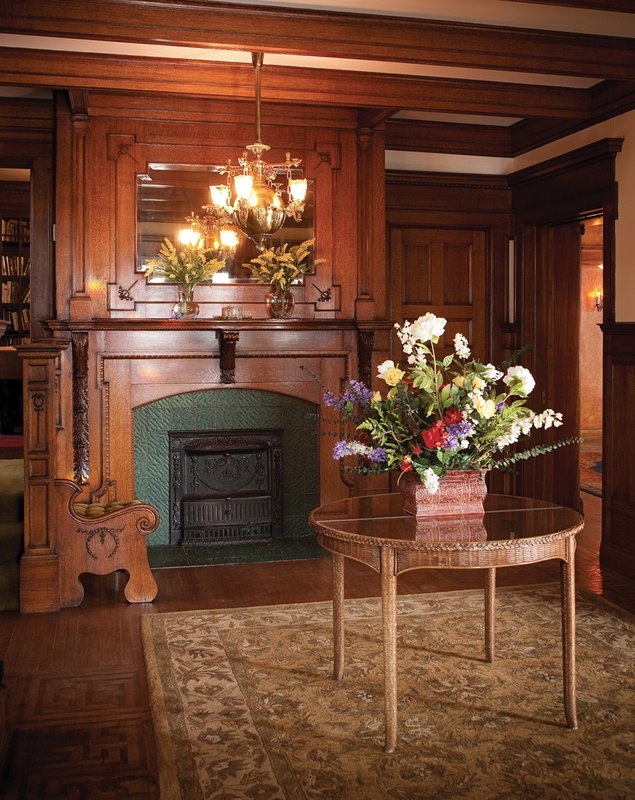 A countless variety of woods—mahogany, cherry, walnut, white maple, oak, hickory and more—were laid throughout the home. Because Kate loved parties, Warren paid special attention to the dining room, installing an ornate radiator that boasted a concealed warming oven next to the built-in sycamore buffet, and a hidden button in the floor for a discreet summons of servants. Even wee Kate’s chair, though at first glance proportional to all the others encircling the banquet table, was special: it boasted an elevated seat. For the boys, a photography dark room and gymnasium occupied the third floor; for Warren and his pals, a lavish club-style billiards room, accessible via a back staircase, was secreted in the basement. But what most set the tongues of Ludington wagging was the pillared balcony. Accessible directly from Warren’s bedroom suite and overlooking the town, the balcony, folks tittered, was built for one purpose: the stage where Warren would one day give his acceptance speech as governor of Michigan, a position his father had sought—and lost—years before. Despite the talk and the hopes—of the people of Ludington and perhaps even Warren himself—Warren never ran for governor. Some theorize it was out of respect for his father. Others say governorship was never Warren’s intention at all. No one knows for sure. Five years after Warren built his grand home on the corner opposite his father’s, Antoine fell down the stairs inside his own home and died. No doubt Antoine died a man proud of all his children, Warren’s successes perhaps most of all. But one wonders if his son’s achievements were ever a threat, if the father felt the sun—or the shadow—cast by a child who followed so closely in his footsteps then rose beyond. Interested in living history? 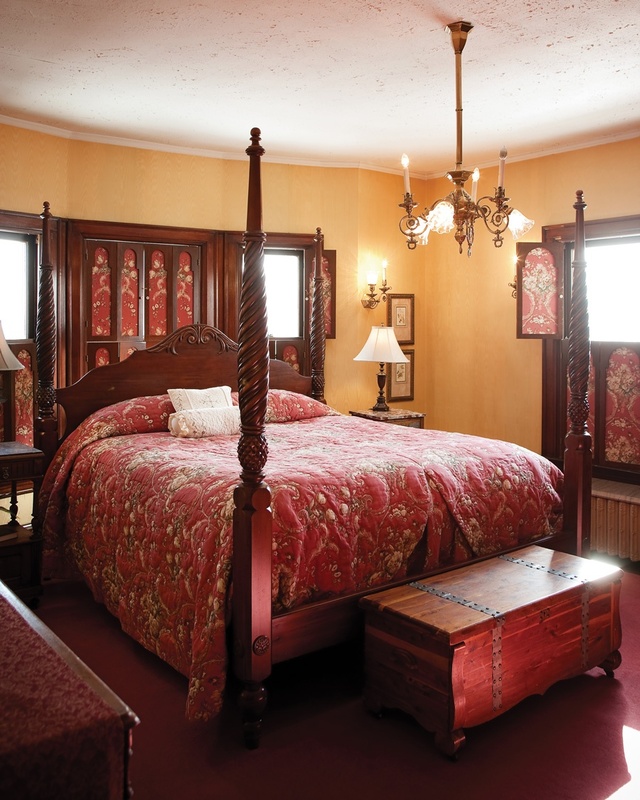 Overnight in one of the Cartier Mansion Bed and Breakfast’s five guest rooms. 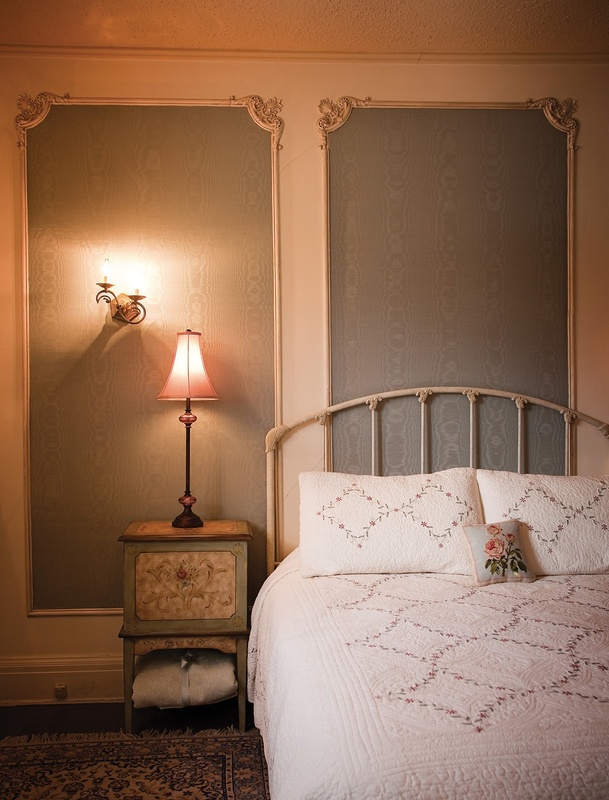 The inn sits within walking distance of Lake Michigan restaurants, shops and the car ferry. Click the cover to read MyNorth’s Benzie Vacation Guide!